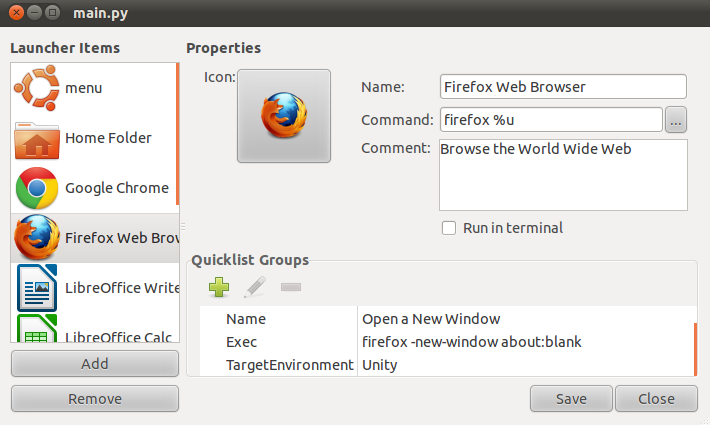 Unity-Launcher-Editor is a GUI designed to manage Unity Launcher items and quicklists. So far, it supports add/remove Launcher items, customize quicklist group, and even change shortcut icons. This project is hosted on Launchpad, and still in the early development phase. 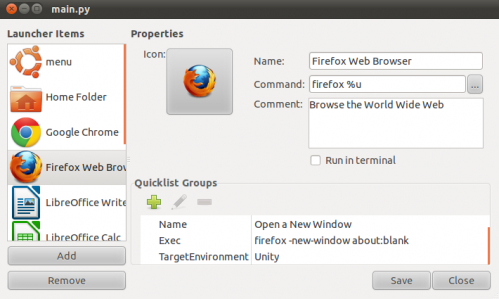 12 users responded in " Manage Ubuntu 11.04 Unity Launcher Quicklist using unity-launcher-editor "
From my perspective, Ubuntu should have similar tool built-in. 3rd party tools are something to be avoided in fine-tuning of OS. did you include the path in single quotes? Excellent work guys. The editor worked nicely for what I wanted it for. I needed to edit the launch command with additional parameters. What’s wrong with using ‘right click’ to change a panel/launcher, Ubuntu Devs? This new Unity Desktop breaks so many conventions, and forces users to switch between the mouse and the keyboard too many times. Drill down menus = 1 click of a mouse, move the mouse, click again. Mouse to full left, click on applications, switch to keyboard, back to mouse to icon. Add to that, no way to choose size of icons to allow quicker, lower ‘steridian’ viewing of visual presentation. I don’t have this working , for Ubuntu 11.10 (Oneiric). Those who do, what Ubuntu, Unity, Python version are you using?